Many thanks to the League of Professional Theatre Women, which has given TheatreNow! its own webpage at https://theatrewomen.org/theatrenow-podcasts. Read how my membership in the League influenced my creation of the podcast series. The League is the nation’s premiere professional organization for women working in all aspects of the theatre. I conceived of TheatreNow! in 2009 while serving as the Co-Secretary of the League of Professional Theatre Women. I was so excited to attend meetings and converse with terrific theatre artists and learn about their experience and new projects. I started to think about how wonderful it would be to record these conversations and share them with the public in order to preserve important events in contemporary American theatre history. So I decided to download some free recording software and use available resources on the internet to record some interviews. I happened to meet Quiara Alegría Hudes’ mother, and asked for her daughter’s contact information. Quiara was happy to give me an interview, and so, TheatreNow! was launched. I followed the inaugural podcast with interviews with women whose careers I felt were interesting and important. I made sure to include women from many different disciplines, and even now I actively seek out women of different races, nationalities and professions in order to give a balanced and inclusive sampling of contemporary theatre practice. And so, TheatreNow! grew from one half-hour recording to a series with a new website at http://hamiltondramaturgystheatrenow.com, an Archivist – the marvelous Helaine, a staff of Program Assistants, and a theme composed by my Co-Secretary Nancy Ford. The series is posted on soundcloud.com, and is very easy to download and share. In Season Two I began to post transcripts of the interviews for the public’s convenience. 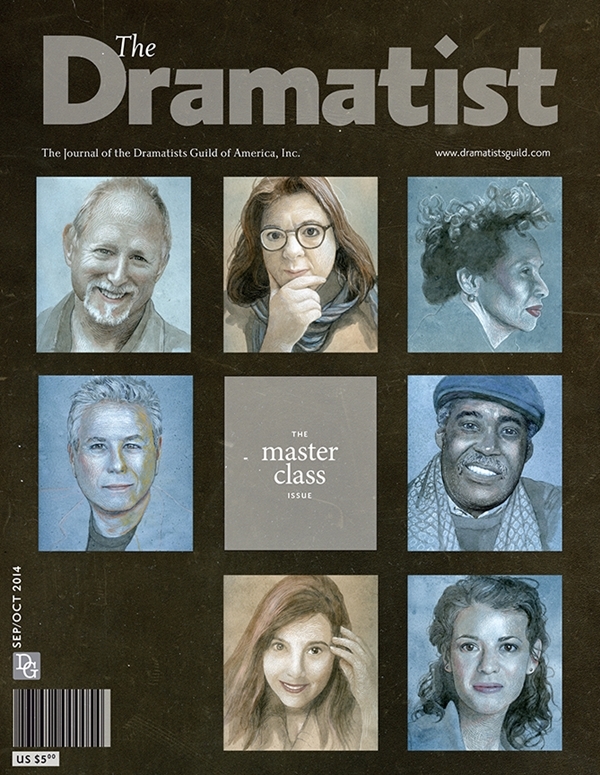 AMERICAN THEATRE published a two-page article on the series in its October 2012 issue. I am now planning my fourth season, and rest assured, it will continue to feature League members, and women whom the League has honored with prizes for their contribution to American theatre. Many thanks to AMERICAN THEATRE magazine (October 2012 – Theatre Communications Group) for publishing a 2-page article on TheatreNow! Margot Melcon wrote an informative and thorough piece on TheatreNow!’s origins, and place in the contemporary gender parity movement. “There’s been a lot of discussion over the past few years about women’s voices being underrepresented in the theatre—there aren’t enough female playwrights being produced, not enough women in executive positions in regional theatres, not enough female directors or roles for female actors. And not enough women speak out as informed, educated, experienced and qualified representatives in the field. Though there has been a flood of discussion about gender disparity, talking doesn’t always lead to action. Congratulations to Quiara Alegria Hudes, who has won the 2012 Pulitzer Prize for Drama. She served as our guest for the inaugural podcast for Hamilton Dramaturgy’s TheatreNow! The Pulitzer Prize in Drama is given for a distinguished play by an American author, preferably original in its source and dealing with American life. The award is for WATER BY THE SPOONFUL, an imaginative play about the search for meaning by a returning Iraq war veteran working in a sandwich shop in his hometown of Philadelphia. Please listen to Quiara speak about her early artistic influences and her artistic process here: Hamilton Dramaturgy’s TheatreNow! Inaugural Podcast with Quiara Alegria Hudes. Here is some great news from Quiara Alegria Hudes, TheatreNow!’s first guest artist. In 2006, my play (and proudest piece of writing) Elliot, A Soldier’s Fugue, was produced in New York, directed by Davis McCallum and featuring the outstanding Armando Riesco as Elliot and Zabryna Guevara as Ginny. The story now continues with the second play in this triolgy. Please join me at Hartford Stage Company in Connecticut for the world premiere of Water By the Spoonful, part two of Elliot’s journey. The role of Elliot will once again be played by Riesco, and Guevara returns, this time as Ginny’s niece, Yazmin. Davis McCallum’s directing looks to be even more engrossing and exciting than last time. Water By the Spoonful is about addiction, recovery, adoption, and choosing your adult path, all set to John Coltrane’s jazz. It is a large, sprawling piece of work set in Japan, Philly, San Diego, and Puerto Rico. I am very proud of this one. Featuring Matthew Boston, Liza Colon-Zayas, Demosthenes Chrysan, Zabryna Guevara, Teresa Lim, Armando Riesco, and Ray Anthony Thomas. For tickets and the performance schedule visit the Hartford Stage Company’s website here. For travel, both the Amtrak Hartford Station and the Megabus Hartford Stations are close to the theater.